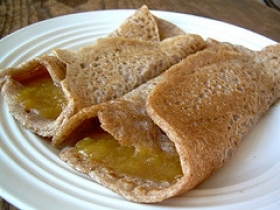 Have you made Amaranth Crepes in Lemon Sauce? 1. 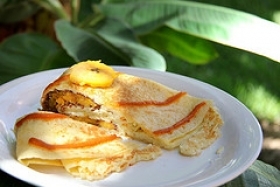 Beat eggs in blender; add other liquids, then flour and salt. 3. Oil lightly. 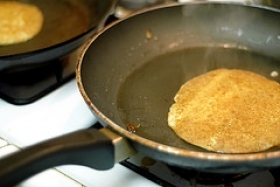 Put 1-1/2 tablespoons butter in pan and tip to spread over surface. 4. Add 1/2 cup batter. 6. 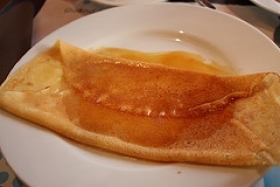 Turn crepe and bake other side. 7. 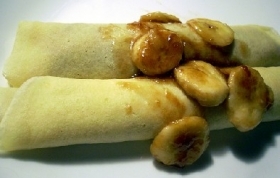 Fill cooked crepe with bananas or whipped tofu; roll up and cover with sauce. 9. 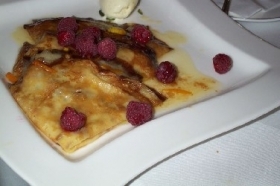 Crepe Sauce: Combine ingredients (except lemon peel) in a saucepan; stir and simmer over medium heat until clear and slightly thick; remove from heat and stir in peel. 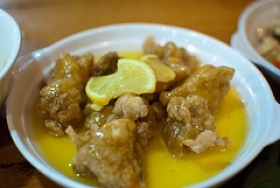 This recipe contains potential food allergens and will effect people with Lemon, Egg, Milk, Butter, Gluten, Corn, Sulfites, Fructose Malabsorption, Citric Acid allergies.